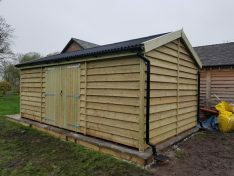 We would like to thank you for the amazing outbuilding, and the excellent assembly job the guys did. It is a beautiful quality building even down to the locks, and we are thrilled. We are the envy of the village, and have had many queries as to the supplier so hopefully you may have one or two visitors from the village. So 5* for quality, fitting and price. Hope to use you again. Just a big thank you for all your hard work over the couple of days it took to build my garage and summerhouse. All though it rained for most of the time you were here you didn’t seem to notice it and the buildings were up a lot quicker than I thought possible. A couple of small problems that arose from my preparation, were met with enthusiasm and a real ‘can do’ attitude, which put my mind at rest and was greatly appreciated. Thanks again and I have happily recommended you to family and friends. A heartfelt thanks to all at Regency for the excellent product that my garage is. It oozes quality and sturdiness and I expect to get many years of use from it. The whole process from initial enquiry to completed product was handled with patience and courtesy. At the design stage all my questions were promptly answered and good advice given. No effort was spared to ensure customer satisfaction, example being the sourcing of non standard coloured shingles to match my existing roof and colour matching of the roller door to our recently replaced composite doors. I was also assisted in complying with building regulations due to the floor space exceeding 30m². Even when delays occurred due to problems with my groundwork’s contractors I was able to come to an arrangement to secure the original quoted price despite an imminent price rise. The erection team have my complete admiration. The night before they arrived 75mm of snow fell and despite more snow, sleet and rain that day they soldiered on. The remaining days of construction were similar with the crew getting a regular dousing of rain and sleet. Even on the days that the sun made a rare appearance it was accompanied by bitter biting winds, undeterred construction continued even in the dark. An excellent product, excellent service and I can heartily recommend Regency to anyone wanting a timber building. Well Done Regency! 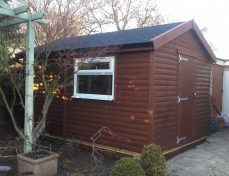 I am really pleased with the product and the guys who came to erect the Shed were excellent. Hope you all have a good Christmas and New Year. I just wanted to say thank you for the new workshop. I’m very pleased with it and very impressed with the quality and your attention to detail – please extend my thanks to all your team. Thank you to all at Regency Timber for our recently purchased Summerhouse. The quality of the Summerhouse is second to none and looks marvelous. I would recommend your company for such an excellent product and also for the professional and courteous service received throughout. Apologies for the very late feedback the garage has been invaluable we have used it to store all our building, kitchen and bathroom materials during the house renovation. I have now managed to get enough room to put my beloved camper in. This was its original purpose. I would like to take this opportunity for the excellent work that you have carried out from start to finish the service has been excellent all the way through. The finished product looks amazing and that fact that it was completed in a record breaking 3 days to erect was very impressive. The summer house looks great! I have attached a pic for your review and will send more at a later stage. Although it is by far the largest shed any of us have worked on it went together really easily and is all very straight and square. I would not hesitate to recommend your company to anyone else who requires a timber building. I felt I had to write and say how delighted we are with our Balmoral summerhouse.It looks really great and is so well constructed.At the same time we would like to thank you for the courteous and professional attention we have received right from the ordering stage to the erection yesterday.We would certainly recommend you and have already handed a photocopy of your brochure to several interested parties. Once again many thanks I am sure we will have years of pleasure and use from your excellent product. To all at Regency Timber.We have recently purchased a Alpine play house from you and may we take this opportunity to thank you all so much for the wonderful service that we received from all of you, a very professional & helpful service was given to us by you all.When ordering it I said could it be here for my son’s birthday on the 2nd of May, however with Easter and the Royal Wedding making the weeks short I knew it was a big ask, so to receive a phone call from you the week before the Royal Wedding I was so shocked to discover it was being delivered the following week. PS Pop a few of your business cards in the post will you? although I tell people who made and installed the store of course it would stay in their mind better with a card wouldn’t it? Thanks again. Thanks so much for the delivery of the workshop yesterday evening. Firstly it is amazing, I was expecting a well constructed building but not quite of the scale you have produced. The size of timbers used, together with the build quality is incredible value for money compared with other manufactures I looked at.Next can you pass on my sincere thanks to your delivery guy, really sorry forgot his name. Very willing and so careful not to damage the product. It was a bit of a struggle for us both and his right elbow was starting to stiffen up, I hope that is okay today and no damage done. If I had understood the weight of the apex ends I should have asked for them to be constructed in half, so apologies for that, or I should have described the delivery route more precisely.Off now to start building as just seen the forecast for tomorrow, 30mm of rain starting midday tomorrow for our area. Thanks again and happy for you to use any of the above in customer feedback. I am, today, the grateful owner of one of your Timber Workshops. The quality of the materials and the structural integrity of the design are second to none, and I would not hesitate in recommending your company to anyone wishing to acquire a substantial and value for money timber building. I must also congratulate you on your workforce. My workshop was erected in a professional and competent manner, by three very personable young men who were courteous, knowledgeable and quietly efficient. In all, a credit to your company. Thank you again for providing me with a worthwhile addition to my property and one that will, due to its build quality last, seemingly, forever. I’d be happy to recommend your company to any of my friends considering the purchase of a tailor made garage. Many thank and kindest regards.